What exactly is an invasive plant, and why should we give a rotten rhizome if one crops up in our side yard? For some native flora advocates, the fight to eradicate invasive plants is tied to the ultimate mission of saving certain species from extinction. However, these botanists maintain that broader goals of ensuring what they term “biodiversity” (coupled with water conservation) are also compelling reasons to shun certain plants, large and small. For the average San Diegan, however, invasiveness is typically of scant concern unless and until it shades a Venn diagram that also includes the noxious factor. I remember the first time I got up close and personal with the bull thistle. I didn’t know its name at the time and regarded it as just another spiny-stalked weed that grew fast and uninvited. In a cursory but sweaty effort to placate my wife, I’d been pulling out the most prominent offenders from our back yard, and although I wore leather gloves, the most-used fingertips had holes, which took the evil thistle no time to locate and penetrate. This left a middle finger (the irony of which escaped me at the moment) was impaled with thin, intensely stinging hairs, the devil’s acupuncture. Several years later, during a dry winter, I resolved to clear the yard for good, laboring by hand to uproot the scented geraniums whose ambitious rhizomes had colonized half the space. I ripped, hacked, plucked, scoured, and extirpated until the plot was bare (albeit stony) earth in every direction. But I neglected to till the area. Beneath the surface, it was “don’t ask, don’t tell.” And I’d forgotten all about the invader whose name I still didn’t know. Not a week later than I’d egged on my lumbar stenosis in the name of weed abatement, it rained. Of course it rained, just enough to trigger the robotic cautions of news-readers who, in lieu of acknowledging an intrinsically arid climate, are compelled to chant, “but the drought’s not over.” And up like thorny missiles went a battery of bright green stalks, some as high as the weathered six-foot fence. 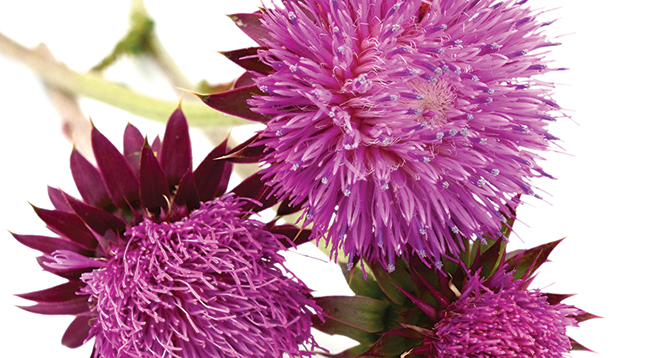 Soon after, each was topped by a bright off-lavender flower, a bristly crown, and I now knew the name of my tormenter—the bull thistle, Cirsium vulgare. Setting aside for the moment my painful bull-thistle remembrances, I asked Gluesenkamp, a Berkeley PhD, to name some of San Diego’s finest…floral invaders. Turns out his familiarity with the least-wanted plants isn’t solely from the ivy-ensconced walls of academia. Arundo donax is but one member of a hit list whose prolific riparian juggernauts cause consternation, if not outright anger, among San Diego’s native-plant advocates. David Varner, resource management director for the San Elijo Lagoon Conservancy, echoes the extant orthodoxy whose focus is on wetlands ecosystems. This brings us to the eucalyptus genus, whose blue gum and silver dollar variants are ubiquitous around the county and emblematic, if not downright iconic, in Rancho Santa Fe and Scripps Ranch. In essence, from a botanical standpoint, invasive plants aren’t keen on sharing. “Yeah,” admits Varner, “but he’d want that water to be available when he turns on the tap. It’s a precious resource and we want to be using it as efficiently as possible. When these trees are removed, the water table goes up.” Varner acknowledges that faster evapo-transpiration rates occasioned by non-natives like the imported palms would have no effect on local reservoir levels — San Diego’s principal water supply is the Colorado River — he maintains that county well water is diminished to some unmeasured extent. And don’t forget the castor bean plant, Ricinus communis, a native North African import whose showy beans yield the makings for ricin, along with a more mundane oil used in folk medicine and as an engine lubricant. It’s the “dark side of agriculture,” quips Varner. Gluesenkamp regales me with the tale of Dr. John Snow, a London physician who made a cholera death map which showed that epidemic deaths were clustered around a certain well. Although some native-plant advocates imbue the effort to drive out invasives with a partisan zeal, Gluesenkamp prefers not to mix politics and plants. Apparently, some people eat various parts of the bull thistle. I choose not to partake.